There are two important things to know about millimeter wave spectrum. First, transmissions on these bands won’t interfere with the lower-frequency (sub-6 GHz) bands carriers have traditionally used. That means the traditional channels and millimeter wave channels can operate simultaneously in the same areas. The other is that the transmission range on millimeter waves is relatively short. Millimeter wave testing is ongoing, but the expected range maxes out at 100 to 200 meters -- basically, the transmission range of Wi-Fi. The short range and non-interference characteristics mean that in an outdoor network, a macro site might cover a large area with long-reach channels in the 600- to 800-MHz band. For dense usage areas, however, a carrier could light up non-interfering small cells operating on those higher-frequency millimeter bands underneath that wide-area 5G (or even 4G) coverage umbrella. Just like Wi-Fi offloading, mobile devices would seamlessly roam off the macro channels onto a millimeter wave channel when they moved into one of those small cell coverage areas. Importantly, as those small cells utilize 5G cellular standards, devices could use the same cell identification and handoff techniques they use to move between macro cells. 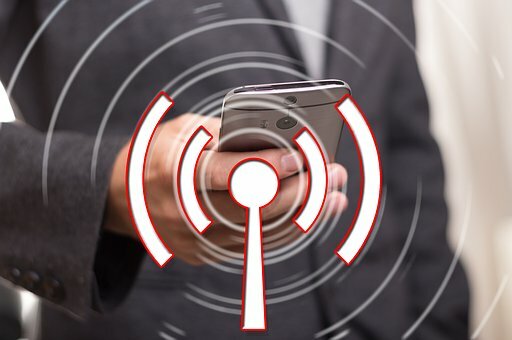 We have seen problems with devices roaming between Wi-Fi and cellular networks, particularly when the Wi-Fi network isn’t operating up to par. What Does This Have to Do With My Wi-Fi Network? As it turns out, carriers have identified two important roles for small cells in the new cellular architecture. Besides providing a way to densify coverage in high-use areas, small cells can replace traditional distributed antenna systems (DAS). Indoor cellular coverage is inherently problematic, with the network being outdoors and the users indoors. Building penetration is always a factor in radio coverage, and the advent of energy efficient LEED-certified building techniques have turned office buildings into virtual Faraday cages. When pressed to improve indoor coverage, carriers had typically deployed in-building DAS, which captured the signal from the nearest cell tower (or from a dedicated cellular base station installed in the building) and used a system of cables, amplifiers, and antenna heads to distribute it throughout the facility. In what’s known as a neutral host configuration, one operator (or a third party like Crown Castle) would install the DAS and then charge other carriers for its use in distributing their signals. Problems arose when the cellular standards outgrew the original DAS design. The big culprit was the use of multiple-input and multiple-output (MIMO) transmissions in cellular. With MIMO, the idea is to create multiple non-interfering channels in the same frequency band to effectively multiply the transmission rate. A two-channel MIMO will double the raw transmission rate while a three-channel system will triple it, and so forth. As you can imagine, MIMO was a main contributor to the improvement in transmission rates we saw with the move from 3G to 4G LTE. The gotcha is that for MIMO to work, the two channels, or streams, must be sent from different antennas, and those antennas must be placed some distance apart (nominal spacing one-half wavelength). The problem was that DAS could only distribute one channel or stream. As the networks moved to MIMO transmission, DAS would still work, but indoor users could only get one stream. That effectively gave indoor users a fraction of the capacity outdoor users would get; user devices automatically adjusted to the capabilities of the cell tower or the DAS through which they connected. It should be noted that the industry has come up with a variety of home solutions (e.g., femtocells) and for business locations of up to about 50,000 square feet. Most of these solutions use your Internet access to connect back to the carrier’s network, though some use an outdoor antenna to connect to the nearest cell site. And Sprint offers Magic Box, which uses a separate radio link to connect back. For large enterprise installations, the options for improving indoor coverage are far more limited. Given that installing two or three DAS systems to distribute two- or three-stream MIMO transmissions was entirely impractical, the industry came up with a solution using small cells that inherently support MIMO. Companies like SpiderCloud and Airvana/CommScope now make small cells of this type, and the deployments look very much like enterprise Wi-Fi networks. In an indoor small cell deployment, a central controller would connect over in-house wired LAN connections to smart antennas located throughout the facility. Again, testing at millimeter wave frequencies is ongoing, but the expectation is that we should have roughly as many small cell antennas as we have Wi-Fi access points (APs). For enterprise infrastructure groups, the big question is: Will the carrier connect all of this equipment over the customer’s existing wired infrastructure (an unlikely prospect given the carriers’ control complex), or will it want to install its own cabling and LAN switches in parallel with the customer’s? I hope you’ve got some room in your closets. One last nightmare is that we might need a separate indoor small cell solution for each carrier supported. There are discussions of neutral host deployments, similar to those used with DAS, for supporting multiple carriers on a shared small cell infrastructure. Those plans, however, are in the very early stages. Click below to continue to Page 3: So, What Are My Choices?